At the end of the year 2012, the paper "Secure stadium experience" was introduced into German football. While this package of measures is into its second season now, we would like to see how our European neighbours handle the topic of security in football. For the start of this series, we took a look at Austria, Turkey, the Netherlands, Sweden, France and Switzerland. In this text, we set our eyes on how things are in Belgium. The original article was published on our German site and then translated by Seb. Football in Belgium, not the best memories from a BVB point of view: It started with a 5-0 defeat against Brugge in 1987 and got even worse when we dropped out of the Champions League qualification in 2003. Brugge beat us again, an embarrassing defeat. 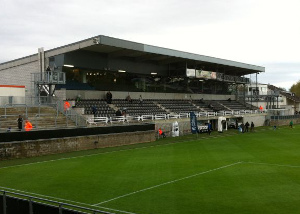 Maybe even more embarrassing was when we got kicked out of the Intertoto Cup against Genk. Not the best memories at all. Despite these wins and the latest rise of the national team, the “Rode Duivels”, the level of the Belgian league is far from high. But what is happening off the pitch in the land of beer and fries? How are the safety levels inside and outside the stadiums and which issues arise between supporters and police? An overview. 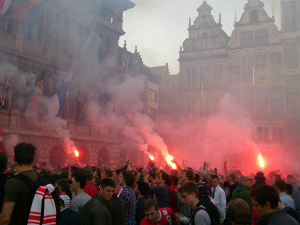 Antwerp, Anderlecht, Brugge and Standard Liege. There have been several fights between the most fanatic supporters of these teams during the 80s and 90s. Like nearly all over Europe there were major violence issues at many matches. And as in most others countries as well the Belgian government tried to deal with these problems, too. With a certain success: In the last 10 to 15 years many things have changed in Belgium. Lesser riots and a lesser provocative atmosphere have been noted. The main cause for this can be seen in the introduction of the “Fancard” in 1999. Every football fan was obliged to have such a personalised card to be allowed to get into a stadium. No card, no live football. Buying a ticket spontaneously without a fancard, not worth trying – you would not get into the stadium anyways. Luckily, the card has been scrapped in 2004. Too late - as damage had already been done to the fan scenes. Additionally, so called “obligatory travel combinations” for fans of some teams (e.g. Anderlecht, Brugge, Standard, Genk and Antwerp) have been introduced, meaning you are forced to take a certain bus combination in order to travel to matches among these teams. These travel combinations are still in use! What that means in detail? I’m living approximately 10 kilometres outside Lokeren. If I was an Anderlecht supporter and would like to see the match Lokeren against Anderlecht, it would be necessary to go the Brussels first, just to get on a certified bus that takes me to Lokeren, passing my front door! Both, the “fancard“ and the “obligatory travel combinations“ had a deep impact on the fan scenes. Although there still singular issues with violence, these are most of the time far away from the stadium and on ‘agreed terms’. Another main cause that helped to diminish violence was the relegation of Antwerp (second division) and Beerschot (fourth division) who had two of biggest hooligan scenes in Belgium. As things calmed down and had been restricted hooligans tend to express their need for violence rather outside of Belgium nowadays, e.g. at Anderlecht matches in the Champions League or the Europa League. These measures have been widely accepted in the past as supporters were not organised. But people became more critical and a few years ago ultra-like scenes were founded which makes a huge difference in giving supporters a voice. It is fairly new that supporters protest against their own team (sometimes quite intensely). Last summer there has been a massive protest at Standard Liege against the owner Duchâtelet who is investing at Carl Zeiss Jena since the beginning of the year, too. In Anderlecht and Brugge training grounds have been stormed and in Genk there were major protests against the management. This shows that fans are not willing to agree with everything anymore. There are certain similarities to other countries, e.g. supporters of several clubs team up for protests against the KBVB (the Belgian FA). Especially, the play-offs-system has been criticised throughout all stadiums hoping for a change of this system. Unfortunately, without any success yet. Speaking of play-offs: To show you the absurdity of this system I will try to explain how it works in Belgium and to be honest, the guy who thought this through must have had a couple of tasty Belgian beers. Otherwise there can be no explanation for this mess. At the moment there are three play-off tournaments after the regular season in the first division. In the first play-off tournament the best six teams of the regular season play against each other. The best team wins the league title, obviously. Winning the last ticket for the Europa League is part of the second play-off tournament where the teams ranked 7 to 14 in the regular season play in two groups against each other. In third play-off tournament the teams placed last and second last play against each other in a best-of-three, meaning five matches in two weeks eventually. The loser is directly relegated. The winner will have to play another relegation round against the second, third and fourth of the second division. For instance, it is possible that a team placed 13th in the regular season still qualifies for the Europa League. They just need to win the second play-off tournament, by winning e.g. group A first, then winning against the best team of group B in a knock-out stage and finally, winning against the fourth of the first play-off tournament again in a knock-out stage. By the way, the points gathered in the regular season are halved in the first play-off tournament, meaning a ten point gap becomes a five point gap, making it easier to close the gap for the other teams. Did you get that system?! The attendances in the play-off rounds are shrinking even though it was fairly exciting this year. And it is quite expensive for the supporters as well: After 15 home matches in the regular season at least five more are added in the play-off tournament. Prices for these are even higher because they are the top matches of the year. 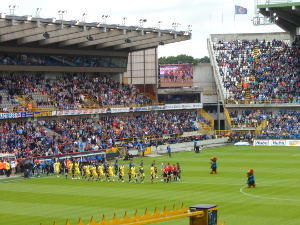 This led to a novelty in the 2013/2014 season: It was the first time since I am into football that the highlight match of the season between Anderlecht and Brugge was not sold out, in a stadium that holds only 25,000 people! Furthermore, in the Champions Leauge not a single match of RSC Anderlecht was sold out. Understandable, as prices range from 55 Euro upwards. Every time I show someone the price for my BVB season ticket, they are massively surprised. The unfair pricing has also led to a successful boycott of several matches in Belgium by the fan scenes. The prices to watch a football match are too high in general, especially when compared to the quality of football. All the top stars, like Hazard and Lukaku, are playing abroad. Young talents are leaving early to play abroad and thus the teams are built on many foreign players which does not help to make people come and watch in the stadium. Speaking of stadiums: Only KAA Gent has a fairly new and modern ground, the “Ghelamco-Arena”. Most of the other stadiums are old and need maintenance. There are plans to renew or even rebuilt some stadiums but it takes years until decisions are made which is also because of the complex political situation in Belgium. But, no matter how old the stadium, there are always security cameras in operation. Fans and clubs get penalised quickly and harshly. E.g. 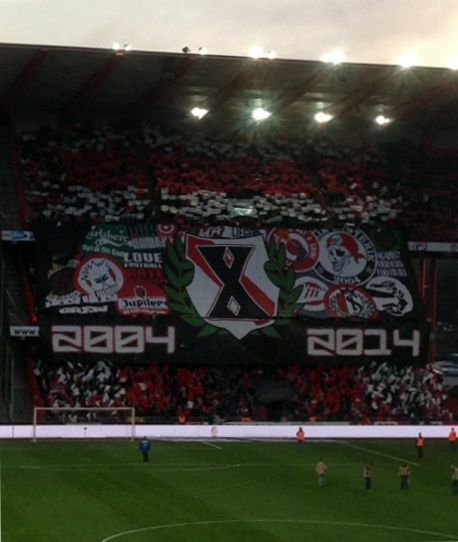 at the match Standard Liege against Anderlecht in 2012 where there were fan protests and pyro technique was thrown on the pitch the whole time. In comparison to the 90s police forces at matches have shrunk dramatically. There are still risky matches with bigger police forces but mostly only stewards are in charge of the security and can get help from the police when major problems arise. Additionally, it is not easy to get in contact with the opposing fans as they are separated (see “obligatory travel combinations above). Compared to Dortmund where all fans are mixed in front of the stadium and it is possible to drink a beer together, that is nearly impossible in Belgium. Even though hooligan scenes have nearly vanished, especially at smaller clubs. Logically, this has helped in the progress to have a smaller police force at football matches, apart from some exceptions. I think that the relations between fans and police are not that different from the situation in Germany: They are not at all our beloved companions. All in all it can be said that everything I mentioned above has had an influence on the atmosphere. There are certain exceptions but mostly it is depressing when it comes to atmosphere in Belgium. Like I said, ultra-scenes are on the rise here and thus the atmosphere has become a bit better. From time to time you can even see some choreographies. So, let’s hope for a brighter future. The author: Frederik Michiels is 36 years old and lives near Lokeren. He is BVB following the BVB since 1996 and is the founder of the Belgian BVB fanclub “BVB Süd-Winners”.